214 pages | 13 B/W Illus. This book examines the civil–social interactions which have shaped and continue to influence the political and social development of modern Gulf societies. It analyses the influence of public and private social spaces, such as sports arenas and dawawin as well as developments in the legal and cultural spheres. Geographically, the volume covers Bahrain, Iran, Kuwait, Oman, Qatar, Saudi Arabia and the UAE. Each chapter discusses a different aspect of current trends in society, offering a multidimensional perspective on recent developments. In so doing, the chapters highlight the existence of a growing participation culture as a force for dynamic social change in a global context. Bringing to attention the continuing social change in public and private spaces, which have increased public social interactions within the last ten years, this books also demonstrates the opening of dialogues between the public and the authorities. The contributors are established scholars living in the Gulf, as well as academics with long-term field research in the region, thus providing unique perspectives on current sociopolitical trends in the Gulf states. 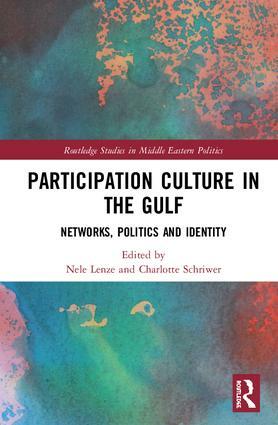 Participation Culture in the Gulf will be useful to students and scholars of Middle Eastern politics and society, as well as social movements and political participation more generally. Nele Lenze is a visiting assistant professor at the Gulf University for Science and Technology in Kuwait. Her research focuses on the cultural online sphere in the Gulf. Charlotte Schriwer is a historian and art hostorian of the Middle East. Her research focuses on various historical studies of the Levant region.